Male and female Steller sea lions. Photo by Andrew Trites. Steller sea lions in Washington belong to the Eastern U.S. stock, which occurs east of 144° longitude from California to southeastern Alaska (Allen and Angliss 2013). Adult males and females weigh up to 1,100 kg and 350 kg, respectively, which makes the species considerably larger than the California sea lion (adult males up to 450 kg, females up to 100 kg). Male Steller sea lions set up territories on rookeries in mid-May; females arrive soon after and give birth to a single pup between late May and early July. Females alternate between nursing their pup and making feeding trips. Most pups are weaned by the end of their first year. In Washington, the species uses jetties, offshore rocks, coastal islands, and navigation buoys as haulout sites. A number of haulouts have been documented in the state (Jeffries et al. 2000). Recent counts found over 1,000 Steller sea lions at haulout sites along the outer Washington coast during their summer breeding season (Figure 2; S. Jeffries, unpubl. data). The species is not known to migrate, but individuals disperse widely outside of the pupping season, thus potentially intermixing with animals from other areas. Despite the wide-ranging movements of juveniles and adult males in particular, exchange between rookeries by breeding adult females and males (other than between adjoining rookeries) appears low, although males have a higher tendency to disperse than females (NMFS 1995, Trujillo et al. 2004, Hoffman et al. 2006). Rookeries in the Eastern U.S. stock are located in Alaska, British Columbia, Oregon, and California. Based on branding and telemetry studies, Steller sea lions in Washington originate from rookeries in Oregon, British Columbia, and Alaska. Pupping areas occur along the outer Washington coast with up to 25 pups born annually. A northward shift in the overall breeding distribution has occurred, with a contraction of the range in southern California and new rookeries established in southeastern Alaska (Pitcher et al. 2007). The stock has been increasing 3.1% annually in southeastern Alaska, British Columbia, and Oregon since the mid-1970s, and decreasing in southern and central California since the early 1980s (Pitcher et al. 2007, Allen and Angliss 2013). The minimum population size for the stock was 52,847 animals based on counts of hauled out individuals from 2001 to 2009 (Allen and Angliss 2013). This count did not include sea lions that were at sea. Using pup counts at rookeries near the end of the birthing season from 2006-2009, the population was estimated at 58,334 to 72,223 sea lions. Steller sea lions are vulnerable to a number of human-related forms of mortality (NMFS 2008). For the Eastern U.S. stock, these include fisheries-related mortality, subsistence harvest in Alaska and British Columbia, illegal shooting, disturbance, entanglements in debris, and contaminants. Other potential factors are predation by killer whales, climate change, and reduced prey biomass, although none are currently considered serious threats (NMFS 2008, Allen and Angliss 2013). Total fisheries-related mortalities for the stock are estimated at about 46 sea lions per year (Allen and Angliss 2013). No mortalities have been reported for drift gillnet and set gillnet fisheries in Washington and Oregon this decade, although mortalities have occurred in the past. Small numbers were killed during the WA/OR/CA groundfish trawl from 2005-2009. No data are available after 1998 for the northern Washington marine set gillnet fishery. Three fishery-related strandings of Steller sea lions occurred in Washington, Oregon, and California between 2006 and 2010. During this same period, two strandings of animals with gunshot wounds were recorded in Oregon and Washington (one in 2006 and one in 2010); this number represents a minimum estimate of this problem. In December 2011-January 2012, a Steller sea lion was one of seven sea lions found shot and killed in Washington. A federal recovery plan for the species was recently revised (NMFS 2008). Critical habitat for the Eastern U.S. stock exists in southeastern Alaska and southwestern Oregon, but not in Washington. Columbia River sea lion management. California and Steller sea lions have greatly increased in abundance below Bonneville Dam since 2002, where they’ve annually eaten thousands of federally threatened and endangered salmon and steelhead migrating up the Columbia River, as well as white sturgeon. Since about 2005, wildlife managers from WDFW and the Oregon Department of Fish and Wildlife have worked with federal and tribal partners to chase away or remove California sea lions from the area immediately below the dam (Brown et al. 2011). Removals include lethal removals and captures for permanent placement in marine aquaria and zoos. Steller sea lions prey more on white sturgeon than spring salmon and steelhead (Brown et al. 2011). However, ecause of their federal threatened status, Steller sea lions have only been harassed in an attempt to drive them from the area; none have been removed. Monitoring. 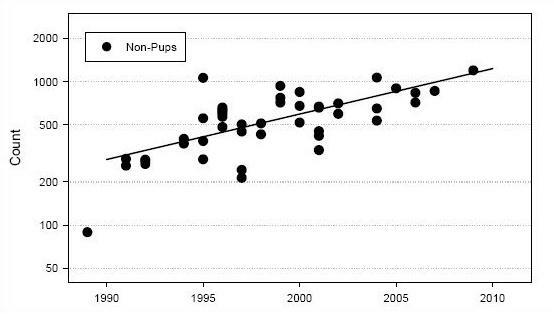 Non-pup and pup counts at rookery and haulout sites are conducted every few years in most of the U.S. range and British Columbia for this stock (Allen and Angliss 2013). Steller sea lion surveys are routinely done in the summer in Washington during annual sea otter surveys (Figure 2). Federal status review and delisting proposal. NOAA Fisheries released a draft status review for the Eastern U.S. stock of Steller sea lions in 2012 (NMFS 2012a). The document reviewed available population data, threats, and management of the stock, and evaluated whether its current listing classification is accurate. Based on the findings of the status review, which confirmed that the stock has sufficiently recovered and is expected to continue growing in the foreseeable future, NMFS (2012b) published a proposal to remove the stock from listing under the federal Endangered Species Act in April 2012. A final decision on the delisting proposal is pending. Research. Considerable research is ongoing for the Eastern U.S. stock and is directed at threats to recovery, including natural and human-related factors. Since 2001, the National Marine Mammal Laboratory and Oregon Department of Fish and Wildlife have been conducting a multi-year demographic study of sea lions tagged or branded as pups in Oregon and northern California. Part of the study involves resighting surveys of branded animals at haulouts in Washington and neighboring regions. Alaska Department of Fish and Game conducts vessel and land-based surveys to estimate survival and reproductive rates and collect scats in southeastern Alaska. The University of British Columbia performs resighting surveys of marked sea lions in southeastern Alaska and British Columbia. Research into the prey requirements and salmon consumption by Steller sea lions in southern British Columbia and Washington has also been conducted (Olesiuk et al. in prep.). Partners and cooperators: NOAA Fisheries, Oregon Department of Fish and Wildlife, Idaho Department of Fish and Game, University of British Columbia, Alaska Department of Fish and Game, Olympic Coast National Marine Sanctuary, Columbia River Intertribal Fish Commission, Makah Tribal Fisheries, and U.S. Army Corps of Engineers, Bonneville Dam Fisheries Field Unit. Allen, B. M. and R. P. Angliss. 2013. Alaska marine mammal stock assessments, 2012. NOAA Technical Memorandum NMFS-AFSC-245, Alaska Fisheries Science Center, Seattle, Washington. Brown, R., S. Jeffries, D. Hatch, B. Wright, and S. Jonker. 2011. Field report: 2011 pinniped research and management activities at and below Bonneville Dam. Oregon Department of Fish and Wildlife, Salem, Oregon, and Washington Department of Fish and Wildlife, Olympia, Washington. Hoffman, J. I., C. W. Matson, W. Amos, T. R. Loughlin, and J. W. Bickham. 2006. Deep genetic subdivision within a continuously distributed and highly vagile marine mammal, the Steller’s sea lion (Eumetopias jubatus). Molecular Ecology 15:2821-2832. Jeffries, S. J., P. J. Gearin, H. R. Huber, D. L. Saul, and D. A. Pruett. 2000. Atlas of seal and sea lion haulout sites in Washington. Washington Department of Fish and Wildlife, Olympia, Washington. NMFS (National Marine Fisheries Service). 1995. 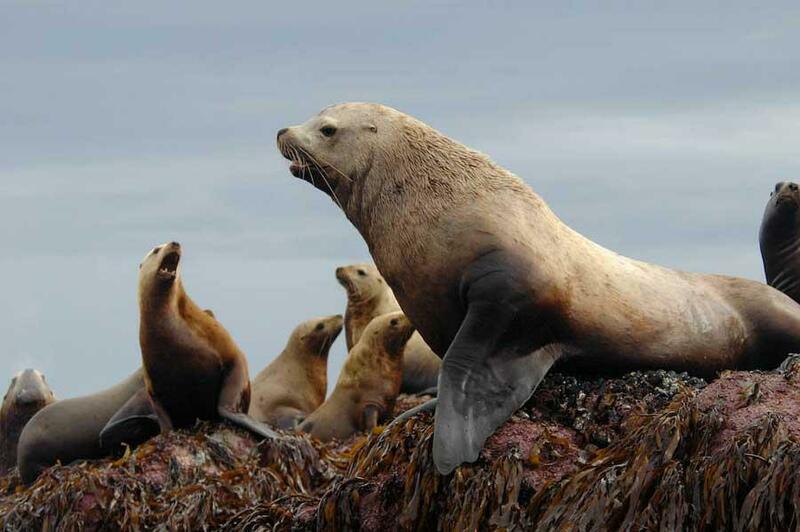 Status review of the United States Steller sea lion (Eumetopias jubatus) population. National Marine Mammal Laboratory, National Marine Fisheries Service, Seattle, Washington. NMFS (National Marine Fisheries Service). 2008. Recovery plan for the Steller sea lion (Eumetopias jubatus). Revision. National Marine Fisheries Service, Silver Spring, Maryland. NMFS (National Marine Fisheries Service). 2012a. Draft status review of the Eastern Distinct Population Segment of Steller Sea Lion (Eumetopias jubatus). National Marine Fisheries Service, Juneau, Alaska. NMFS (National Marine Fisheries Service). 2012b. Endangered and threatened species; proposed delisting of eastern DPS of Steller sea lions. Federal Register 77(75):23209-23220. Olesiuk, P. F., S. J. Jeffries, M. M. Lance, A. W. Trites, P. J. Gearin, K. Miller-Saunders, A. Tabata, S. D. Riemer, and D. M. Lambourn. In prep. Prey requirements and salmon consumption by Steller sea lions (Eumetopias jubatus) in southern British Columbia and Washington State. Research Document, Canadian Science Advisory Secretariat. Pitcher, K. W., P. F. Olesiuk, R. F. Brown, M. S. Lowry, S. J. Jeffries, J. L. Sease, W. L. Perryman, C. E. Stinchcomb, and L. F. Lowry. 2007. Status and trends in abundance and distribution of the eastern Steller sea lion (Eumetopias jubatus) population. Fisheries Bulletin 107:102-115. Trujillo, R. G., T. R. Loughlin, N. J. Gemmell, J. C. Patton, and J. W. Bickham. 2004. Variation in microsatellites and mtDNA across the range of the Steller sea lion, Eumetopias jubatus. Journal of Mammalogy 85:338-346.